It’s been quite a journey for Terre Lee, now in her final quarter at UC Santa Cruz, as she contemplates graduating in June and thinking about what lies ahead in her future. After being on campus for five years, she’s looking forward to continuing the amazing work she started here and expanding on her passion for music and teaching. 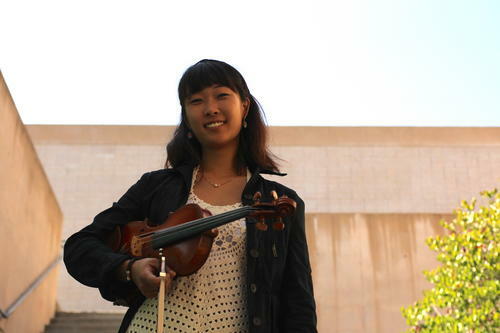 While studying at UC Santa Cruz as a double major in Music and Economics, she’s lead a team that was nominated for the $1 million Hult Prize for creating an early education music program for underserved communities; done extensive research on how artists can create successful marketing efforts; taught violin every week to lower income children; and had internships at various local organizations including the Arts Council and Kuumbwa Jazz Center in Santa Cruz. “I was originally drawn to UC Santa Cruz because I wanted to study environmental science,” she says. “Based on what my friends had told me, UC Santa Cruz sounded like a beautiful place.” Growing up in Pasadena, Terre had also been expected to attend UCLA, as the rest of her family had done, but was eager to leave the congestion of Los Angeles for more peaceful surroundings. Since Terre had her first violin lesson at age five (and has been playing ever since) and was taught piano at an even earlier age, music is definitely in her DNA. “My mom played the piano in college so we always had a baby grand in the house,” she says. “And when I told her that I wanted to play the violin, she jumped on that.” Inspired at that young age by seeing a clip from the film The Red Violin, she liked the sound of the instrument and knew then that was the one for her. As she focused more on the violin and less on the piano, her parents enrolled her in the prestigious Colburn School’s Conservatory of Music in Los Angeles to continue with her music studies while also attending a very academically focused all-girls liberal arts high school near her home. “I had a really fantastic education,” she says of her time there. On top of that, Terre participated in water polo for four years, cross-country for two, and, since she had taken gymnastics since she was a toddler through age 13, also coached gymnastics. Once she decided to switch majors in her junior year, she started taking more music classes that surprisingly lead her to also choosing to pursue economics. “I originally didn’t think that I would stick with economics,” she says. “But I ended up taking an economics class with Professor David Kaun and totally fell in love with it. It was Labor Wars and Theory and Film, and it was a film class and discussion limited to 20 students. We discussed labor unions and various economic paradigms and it was a very well rounded scope of how to look at society. Professor Kaun is an economist who doesn’t really use numbers too much…it’s more like philosophy. Plus, he’s also a musician. He started as a music major and switched to economics, so that was a great connection for me.” Terre was also a Teacher’s Assistant in Kaun’s Economics and Performing Arts class, which she really enjoyed. Being recently chosen as a finalist for the distinguished Hult Prize – one of 250 selected from more than 20,000 applicants from all over the world – was quite an honor and one that was well deserved. Based on her experience teaching violin three hours a week at the Gault Elementary School in Santa Cruz using the El Sistema method, she and her team (fellow students Kymberley Kudravy and Justin Kohlberg) are developing a similar, more expanded program for young children called El Sistema First Steps (formerly called Hands On). Terre teaches violin to eight, third grade students three times a week for one hour at a time. The program itself takes place every day afterschool and is a big hit with the children and parents alike. “It’s so great for kids and they love it,” says Terre. “Part of the guidelines for El Sistema is that it’s for low-income families who can’t afford music training and the classes also have to have performances in the community.” It’s this progressive model of education that has inspired Terre and her team to create their own El Sistema First Step program and she is looking forward to developing a full curriculum that will be aimed towards much younger children who are in daycare and community centers. It will include guidelines not only for teaching music, but also for related activities, such as games, movement, and how to introduce simple musical instruments into the mix. Terre is now looking for funding and already was awarded a grant last spring. With that in mind, Terre and others in the Music Department have initiated professional development workshops, lead by faculty members, covering topics from how to promote yourself as an artist and how to open a teaching studio, to what it’s like to become a professional conductor and composer. After that, Terre will start on a new path, beyond academia, returning to Santa Cruz and the Bay Area to bring El Sistema First Steps to fruition. Her goal has always been discover new possibilities and help others. “I want people to care about something that is bigger than themselves.” Terre is certainly an excellent example of how that can happen.